Cyrus launches its soundBuds true wireless in-ears | What Hi-Fi? Cyrus has launched its new true wireless in-ear headphones, named soundBuds. The soundBuds incorporate much of the technology we’re now used to seeing in what is one of the fastest growing audio markets, including a built-in microphone for wireless calling, the soundBuds will be aggressively priced at only £79. Cyrus has used a small but "very high performance" driver in pursuit of a light, comfortable pair of Bluetooth earbuds – they weigh only 4.5g each – and will ship the buds with three sizes of soft in-ear hook for a secure fit. 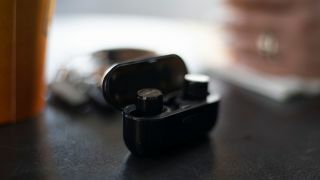 The soundBuds come with a charging case, which will charge the headphones fully three times before needing to be plugged back in itself, and promise at least two hours battery life before requiring any extra power (standby time is 80 hours). They are available now via Cyrus’s website, online retailers such as Amazon and in partnering stores across the UK and Europe. We’ve not yet been able to recommend a pair of true wireless in-ears at this price, so we’ll be eager to get the soundBuds in for a full review as soon as possible.